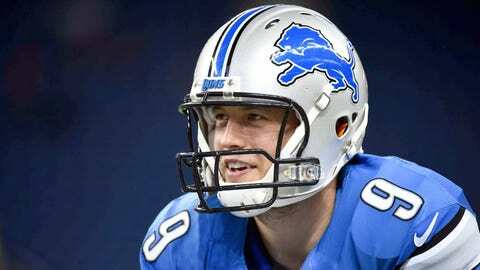 Lions QB Matthew Stafford ended a long losing streak with an overtime win against the Bears on Sunday. The Detroit Lions stole their first win of the season against the Chicago Bears on Sunday, as they found a way to top their NFC North rivals, 37-34, in overtime at Ford Field. For the Lions, it was the first victory they tasted in a long time. The Lions rattled off five straight losses to start the 2015 season. Dating back to last year, the Lions also lost in the Wild Card round of the playoffs (24-20, at Dallas) and in Week 17 of the regular season (30-20, at Green Bay). Before this past Sunday, the Lions’ most recent win was a 20-14 triumph over the Chicago Bears at Soldier Field on Dec. 21. The Week 6 win over Chicago is no consolation for a season that’s probably lost after such a poor start, but it’s fitting that Detroit’s seven-game losing streak — which spanned 10 months — was bookended by wins against the Bears.